Tarpans, may have well been the last surviving population of European wild horses, or maybe not! The Tarpan whether ancestor of modern day horses or just another feral population, lives on in the genes of the equids extant today. Konik, Hegardt, Heck or whatever else we choose to call our modern day interpretation of the Tarpan, we must not forget they went extinct not too long ago. Although the Heck brothers believed that they could back-breed the Tarpan into extancy, and despite their wonderful results, this thinking is fundamentally flawed. There is a general lack of supporting evidence to claim that the Tarpan was a true wild horse, evidence (…) “is limited to osteological material of two specimens and it has not been reliably identified with Pleistocene or Holocene local populations,” so it does not come as a surprise that “its status as a wild rather than a feral form is disputed.” Grubb (2005). It seems at times that the movement to consider the Tarpan finally back-bred into existence is possibly plagued by issues of natural pride, or even romantic naturalistic views of re-wilding our landscapes with Pleistocene portraits. It was German Naturalist, Johann Friedrich Gmelin who first described the Tarpan in 1774 after his observations of these animals in the region of Borbrovsk, near Vornezh in 1769. Gmelin (1774) described these horses: “hardly as large as the smallest Russian”; with very thick heads, pointed ears, short frizzly mane, and “tail-hair shorter” than in domestic horses. They were mouse-coloured, with white or ashy-grey belly, and the limbs black from the knees and hocks down. The hair was very long and thick. Gmelin and the peasants assisting him killed a stallion and two mares, together with a Russian mare that had run wild with the herd, and captured the hybrid she had produced as well as a pure-bred foal. It seems that debate has not dissipated, and the letter of the rule has been largely ignored, applying E. ferus for the Tarpan to avoid possible confusion with its domesticated cousins, E. caballus. Other taxonomical synonyms accumulated over the years are: Equus caballus ferus (Boddaert, 1785), Equus equiferus Pallas, 1811, Equus sylvestris Brincken, 1828, Equus ferus sylvestris (Brincken, 1828), Equus caballus sylvestris (Brincken, 1828), Equus gmelini Antonius, 1912, Equus ferus gmelini (Antonius, 1912),Equus caballus gmelini (Antonius, 1912), and Equus gmelini silvatica Vetulani, 1927, Equus tarpanPidoplichko, 1951. The last Tarpan died in captivity in Russia in 1909. The photo below was taken in 1884 and is the only known photo of the so called Tarpan. This particular stallion was caught near Kherson (Ukraine) and later purchased by the Moscow Zoo where it died at the age of 21. 1. Tarpans are considered the direct descendants of a wild population from Pleistocene times. 2. Tarpans were nothing more than feral horses. In 2003, the ICZN “conserved the usage of 17 specific names based on wild species, which are pre-dated by or contemporary with those based on domestic forms”, confirming E. ferus for the Tarpan. 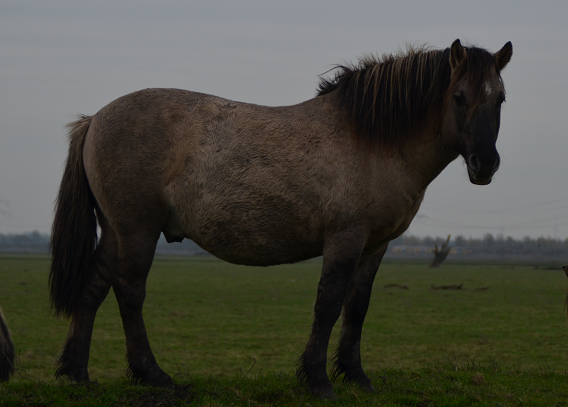 Taxonomists who consider the domestic horse a subspecies of the wild Tarpan should use Equus ferus caballus; the nameEquus caballus remains available for the domestic horse where it is considered to be a separate species. It has stipulated that ferus is not invalid but has not specified explicitly what name is to be used for the species by those who consider E. caballus and E. ferus to be conspecific (see Bock, 1997). Material evidence thatferus is a distinct form of wild horse is limited to osteological material of two specimens and it has not been reliably identified with Pleistocene or Holocene local populations (Forsten, 1988). Its status as a wild rather than a feral form is disputed (e.g. Epstein, 1971) and it is not regarded as ancestral to domestic horses by Kuz’mina (1997). Accordingly ferus is here treated as a subspecies of E. caballus. The systematics of ferusneeds to be more thoroughly reviewed. (Grubb, 2005). 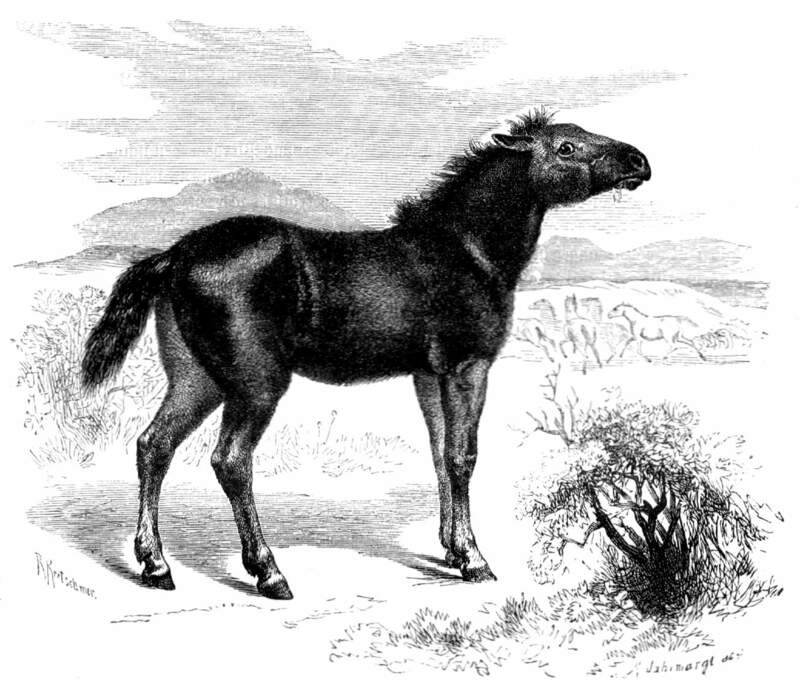 Heck horse – The german zoologists; Heinz Heck and Lutz Heck proposed to resurrect the extinct Tarpan by combining and rearranging the genetic material, through selective breeding, of hypothesized descendants of the ancestral Tarpan that had gone extinct in the wild in the 1890′s. 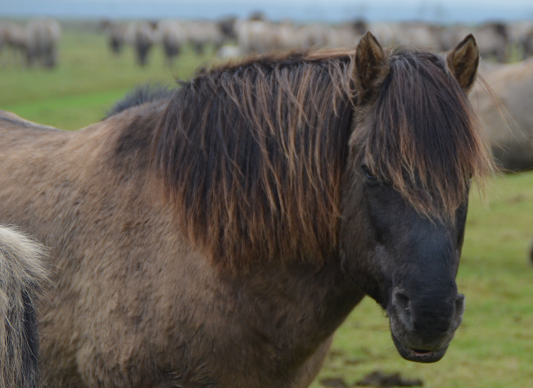 In their breeding-back program they selected Konik, Gotland, and Icelandic mares. These mares were bred to a Przewalski Stallion, and the first colt was born around 1933 in Tierpark Hellabrunn, Munich. Konik pony – In 1936, these groups of small, tarpan-like horses caught the attention of Tadeusz Vetulani, a professor at Poznan University. He gathered up the most suitable candidates to concentrate their primitive characteristics in an attempt to breed-back the tarpan. He named these horses “koniks” which is the Polish word for small horses. They were short, some 110–130 cm high at the shoulder, frequently having a dun (mouse-gray) coat and a dark stripe down their backs, and often striped limbs. Hegardt horse – In the 1950′s Harry Hegardt gathered up American mustangs with tarpan-like characteristics to create his own stable of Equus ferus ferus – never mind that mustangs are descended from Spanish riding horses that had been domesticated for centuries. A list of references used in conjunction with those already listed in our Biblio Page. Grubb, Peter ( 2005). “Order Perissodactyla”. In Wilson, Don E., and Reeder, DeeAnn M., eds. Mammal Species of the World: A Taxonomic and Geographic Reference (3rd ed.). Baltimore: Johns Hopkins University Press, 2 vols. Groves, C.P. & Willoughby, D.P. 1981. Studies on the taxonomy and phylogeny of the genus Equus, 1: subgeneric classification of the recent species. Mammalia 45:321-354. The Extinction Website. “Equus ferus ferus”. Recently Extinct Animals.